"Glitter" at Intermedia Arts Mind Fields Exhibition, originally uploaded by Amy Rice. My first position with Spectrum Community Mental Health involved leading art classes for “Span”, a program that was specifically designed to serve adults living with a mental illness as well as cognitive impairments. Most of the Span clients had physical disabilities as well. The program had been around for some twenty years before me and the art group had established it’s own rhythm and way of doing things. For many clients there was but one way to properly finish off an art effort and that was by the addition of glitter. “Adult artists use adult tools and mediums.” I declared. “No one can make a decent piece of art with markers and construction paper”, I pronounced. I took away the Crayola markers, the wax crayons, the painted macaroni noodles, the latch hook kits, the coloring pages, and the glitter. We made art. I was a cheerleader for fine art, finished compositions, and creative challenges. We had shows, we sold art, we won awards, there were articles in the paper; we were a group of artists. As artists we attended local art shows for education and inspiration. It was almost two years into my position at Spectrum when, at an outing to a local gallery, a group of Span clients stood around a beautiful piece of art made entirely of glitter. “We used to have glitter at Span”, I heard one of them say sadly. That next day I hauled out the painted macaroni noodles, the markers, and the glitter. That next winter in a galley exhibition of my own work were paintings that glimmered a bit and if you looked closely, yep, glitter. My intentions had been good. It had been important to me to treat these artists like the adult artists that they were. For many people living with a serious and persistent mental illness, art groups, art therapy, and occupational therapy…all of these have been embarrassing, infantilizing experiences. They have been (or have felt like to many) a way to pass the long hours of hospitalization or day treatment. The products of their efforts thwarted by the inadequacies of their materials, or made to seem irreverent as they are tossed or recycled into reusable art supplies at the end of the session. My intentions had been good, but in limiting their access to glitter, by declaring what were adult supplies and what was childish I had taken away a choice, and as adult artists they deserved to be able to choose glitter. At the Spectrum ArtWorks Studio we focus on fine arts and fine arts supplies. But as one of the last surviving art programs at our organization with a thirty year history involving dozens of programs that utilized art at one point or another, we have inherited all matters of arts and craft supplies and now, nothing puts a smile on my face like a finished piece of art with some well placed glitter. 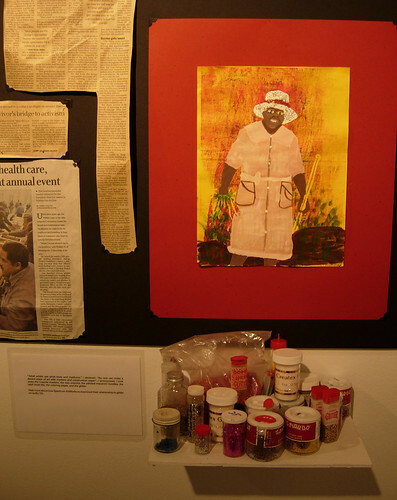 One of my dearest friends has worked in Harlem for the past twenty years doing the same work as you and it's amazing to see what beautiful work her clients do with all kinds of materials -- glitter, glue, found objects -- just beautiful, beautiful stuff. amy- i love this story. this is truly a beautiful story.. thanks for sharing it! Yes I love this little story. Crayons and markers are my favorite "serious" art supplies. Couldn't do withou them. I confess in the past I've sarcastically cried "glitter fixes everything." As a social sorker and artist, I share in the belief that more opportunites to access, create, and share art should be made available.